Louis Shannon Brook was a 21 year old farmer at ‘Hillside’ Curban NSW, when he enlisted in August 1914. He was 5’1”, 10st 13lb (69kgs) and had a florid complexion, blue eyes and light brown hair. Louis Shannon Brook was born in Pimpinio, Victoria, the 2nd child of Fred and Eliza Brook (nee Bullen), and was one of six children. He enlisted August 28, 1914 in Sydney with many men from Gilgandra and the Central West of NSW and was placed with the 1st Light Horse Regiment C Squadron. After training at Roseberry they embarked at Sydney on the ‘Star of Victoria’ October 20, 1914 and were part of the First convoy that left Albany on November 1, 1915. This was to be the last time that many of the young soldiers saw Australia. After training in Egypt, he was at Gallipoli from May 9, 1915 until October, when he was admitted to Cairo Hospital with tonsillitis and rejoined the unit December 2, 1915 in time to be evacuated from Gallipoli in December 1915. The Light Horse was involved in the 3rd Battle of Gaza (which included Beersheba) from October 27 to November 7 1917. Brooks was wounded in action at Tel Khuweilfeh on November 3 with a gunshot wound to the chest. 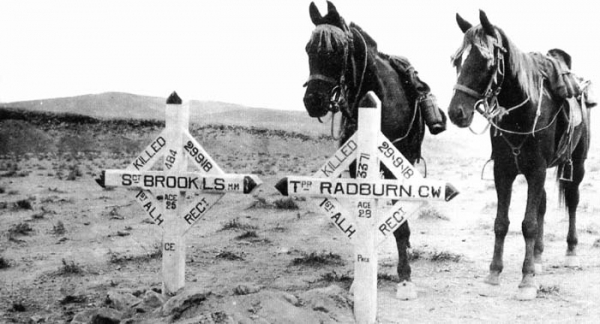 He was one of 57 men wounded and 13 men killed; 10 officers were wounded and 3 killed; 22 horses were killed, 62 wounded and 4 missing in the action. He rejoined the 1st Light Horse onJanuary 4 , 1918. His promotions were as follows; Lance Corporal January 1, 1916, Corporal Nomvember 21, 1916; and Sergeant on October 31, 1917. A Military Medal was approved for Louis Shannon Brook the day before he died. It was awarded because at Amman on September 25, his troop had passed through machine gun fire and were unable to withdraw, he cut the wire while under machine gun fire and enabled his troop to retire to safety. He saw service in Gallipoli and Palestine and was killed in action September 28, 1918. ‘Sergeant Brook came from Gilgandra. The informant intends going there in a few days and will then see Brook’s people’ Sergeant JF Clancy 401. A Gilgandra boy who enlisted with the other young men of 1st Light Horse. The Memorial Plaque and Scroll was received December 12, 1922 by his father at 72 Tyler St, Preston Victoria. He is also commemorated on the grave of his sister, Burly Vera Brook who died October 25, 1916 aged 17 years. The following words are on the Curban Cemetery grave. No 484 Sergt L.S. Brook M.M. The Gilgandra Shire gave a scroll to all the local returned men and the families of the fallen. Many of these scrolls have survived today, showing how valued and appreciated they were.